Shalom Aleichem and welcome to my bi-monthly blog! Although God had to judge the world through a worldwide flood, it was not as though He wasn't merciful or long-suffering. He did not destroy mankind immediately but waited patiently for over 1600 years, holding back His judgment so that they could return to Him in repentance. And God did not just sit back and do nothing during this period. He warned them through Enoch of the coming judgment. Enoch even named his son Methuselah ... See More (meaning “his death shall bring”) as God’s message to the wicked, for on the year Methuselah died, his death brought about the Flood (Genesis 5:25-29, 7:6). And God not only just waited and warned. 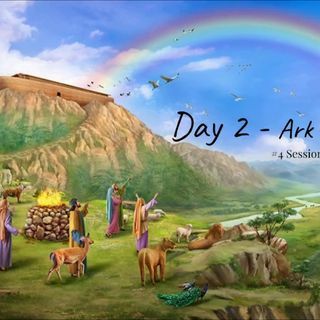 As the title of my blog today indicates, the Second Day also revealed God’s plan of salvation through Noah’s Ark - this vault as it were separating the flood water below it from the rain water above during the first judgment. This first ark ultimately points to Jesus, our Spiritual Ark of salvation. In 1 Peter 3:20-22, Peter explained how just as Noah and his family were saved through water by the ark, rising above God’s judgment of mankind seen in the flood below it, we are now saved through the water of baptism as we put our faith in Jesus, who by His resurrection lifts us up from death to life and from the coming judgment of God at the end of time. Indeed, when we look at the very names of the ten generations from Adam to Noah, they spell out God's wonderful plan of salvation in Christ!